The first clue that something different was to happen yesterday was the sight of the gardeners hand-picking leaves that littered the stones covering the garden beds of the Chinese Garden. A very zen-like activity which I was told preceded an afternoon wedding. 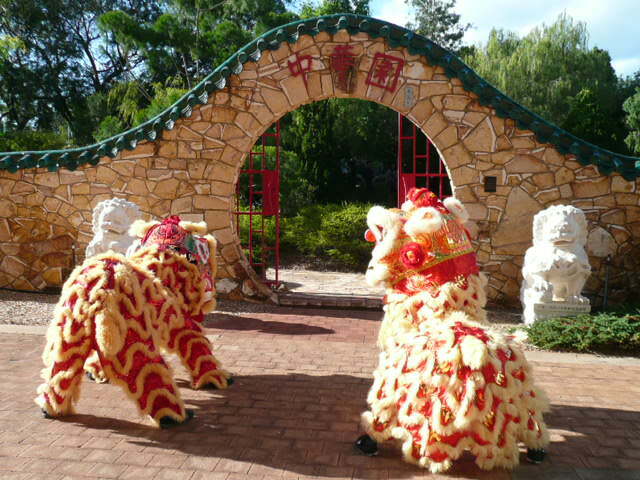 Late in the afternoon local office workers were distracted by an unusual sight: two Chinese dragons from the Chung Wah Society welcomed the a wedding group as they arrived for their wedding in the Chinese Gardens. Entering the Gardens through the circular gate and preceded by the dragons was no doubt a highly auspicious beginning to their marriage. Despite the solemnity and importance of the wedding, the dragons acted like rather wayward children: fluttering their large eyelashes, flapping their whiskery chins and flopping to the ground rather like a tired feline. It’s a wonder the guests could concentrate on the important business of the day. The conclusion of the ceremony appeared to be marked by the dragons dancing in celebration. It also marked the return to work for those of us who had been greatly entertained by the event, with our spirits lifted and amused in preparation for the weekend. This was also a reminder of Darwin’s strong Chinese heritage as evidenced by the Dragons entering parliament each year or visiting businesses on Chinese New Year. It was a very fitting and entertaining end to a busy week – good fun!